As we approach the shortest day of the year, please don’t forget to keep your pets safe when they are out at night. You could decide to go for a short walk at 4pm but before you know the light has gone – don’t get caught out. With dogs there are number of routes you can go down, such as reflective jackets or collars, illuminated collars, or lights to add to any standard outer wear. But there are lots of options to choose from – what works for one dog will not necessarily work for another and it also depends on the type of walk they have and the area in which they are walking. 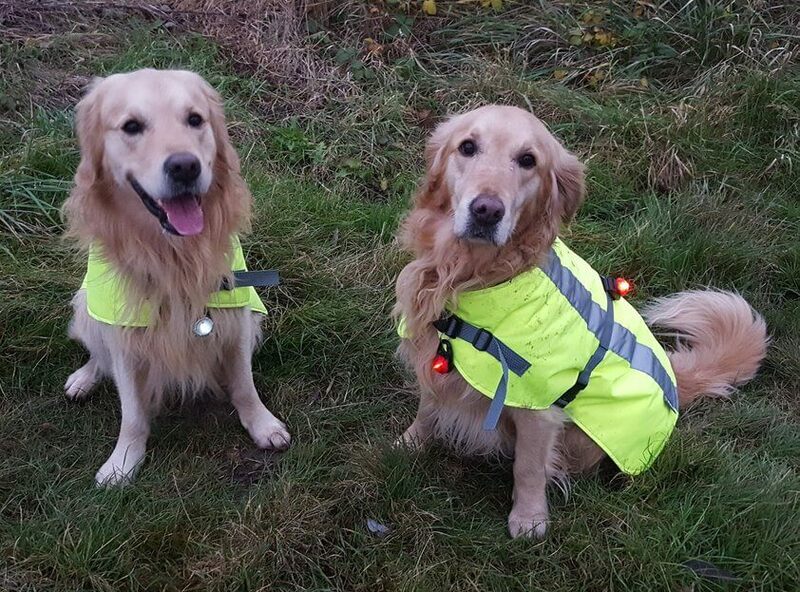 With our dogs they have a combination of field and a road walk so we go for high-viz jackets and lights. The lights we use can be seen from quite some distance which is great once they pick up on the scent of something exciting in the undergrowth which has come awake at night – and they’re off … Then coming back along the road, their high-viz jackets can be seen very easily when a car’s headlights reflect off them. Particularly good on a country lane as you find that most cars do slow right down for you. Don’t worry or think about your dog “not wanting to be seen in such an outfit” – their safety is the most important thing. Our dogs become so excited when you take their jackets out of the cupboard as they know they are going for a night time walk when all the smells are completely different to the ones they observed during their walk that morning. Remember to keep yourself safe as well with light jackets at the very least but preferably with something reflective such as armbands, a reflective bib which you can wear over your jacket or a high-viz jacket to match your dog’s. Don’t forget to carry a torch. And don’t forget your small feline friends. We all know that most cats like to roam at night because there is just so much wildlife activity and their eyes are far superior to ours in the dark. So, they really don’t have any comprehension that we, as humans, do not have the night vision they do. Of course the safest solution is to keep them inside but if that is not an option just ensure they wear a collar which has some form of reflective or high-viz material so that if they decide to venture close to the road, cars headlights can easily pick them up.